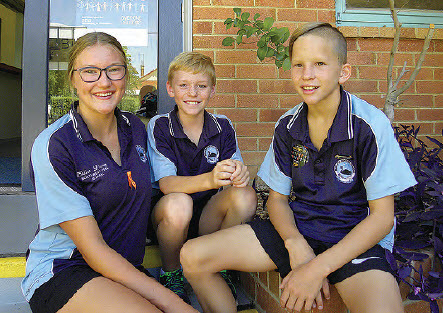 Three students from Bingara Central School are in training to represent the school at the State Championships next month. Erica Dixon, Brock Galvin and Liam Johnson qualified to represent Bingara Central School and the North West at the Regional Swimming Carnivals in Armidale. Erica Dixon, Liam Johnson and Brock Galvin are competing in Sydney this month. The NSW PSSA Swimming Carnival will be held on April 11 and 12. Eleven year old Brock Galvin has, according to his mother, Tiffany, been swimming “right from when he was a little dot”. In Year 3, he was Junior boy champion at the school carnival, and has been Champion at each carnival since then. In 2016 he swam in Sydney for speedo print finals, in the butterfly event. In 2017 he swam in backstroke and breast stroke. This year has been a busy year. Brock went to Port Macquarie in January for the Swimming NSW Country Regional meet. Two weeks later he went to Werris Creek for the speedo sprints and the Long course Championships, and the North West Championships where he came third in breaststroke. Then he went to the Speedo Sprint finals in Sydney where he swam the weekend before last. At the Bingara school carnival this year Brock broke five records. Brock says his favourite strokes are butterfly and backstroke. Brock’s events will be the 50m Breaststroke, Backstroke and Butterfly. Eight year old Liam Johnson also can’t remember not swimming. “We used to have a house with a pool, but we don’t now,” he said. “Sometimes I go to the Bingara pool to (practise) starts for state,” he said. Liam will be swimming in the 50m Freestyle. When he is not swimming, Liam enjoys playing rugby league, cricket and soccer. He recently tried rugby union, which he also enjoyed. Erica Dixon will represent Bingara in the 100 metre breaststroke at State. Fifteen year old Erica is a busy girl indeed, with a long history of Swimming Club activity, taking part in out of town carnivals as well as club nights. Erica has been in serious training for the State competition. She trains in Bingara on Tuesday and Thursdays, and Wednesdays in Inverell before her ballet class. An accident at Bingara Pony Camp in September where Erica suffered a knee injury “took me out for a while”, but physiotherapy and exercise have helped her recover. Erica’s week is jam-packed with sport, music and dance. On Mondays, she has band practise followed by swimming training; Tuesdays are spent in Tamworth where she has physio, and swimming in Bingara. Wednesdays are ballet, with some swimming at Inverell. On Thursdays Erica has footy training, swimming and Austag, and on Fridays she is again dancing. The different activities, she says help each other. Music helps my lungs, and dance builds strength,” she said.